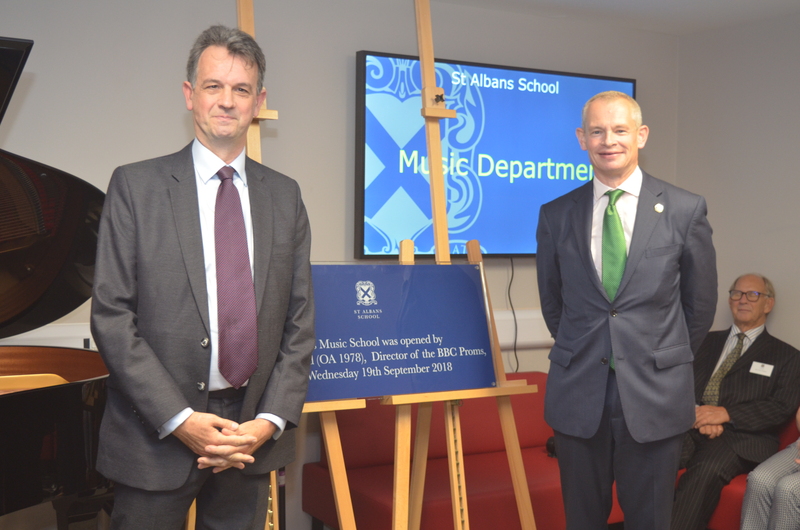 Wednesday 19 September saw the greatly anticipated, official opening of the new Music School. It was a chance for Music staff and students, past and present, to thank those who so kindly donated to this project. The man tasked with the job of revealing the official plaque was David Pickard OA. Since leaving the School in 1978, David has held various esteemed Directorships of such ensembles as the Orchestra of the Age of Enlightenment and Glyndebourne Opera; in his current role as Director of the BBC Proms, David was well qualified to lead the party of fellow OAs, VIPs, Governors, staff, parents and pupils in the official opening. Both he and the Headmaster spoke to the gathered guests, acknowledging the importance of Music not just as an academic subject, but as a co-curricular activity, which can finally take place in one on-campus venue. The evening primarily gave donors a chance to see the Department in action; several students and ensembles were playing in the new practice rooms and recording studio, as our guests explored. During the speeches, Liam White treated us to a performance of Chopin’s Berceuse on the Department’s brand new Steinway mini grand piano in the Smith Space, whilst Sir Martin Smith OA and Lady Smith OBE proudly looked on. The event also afforded everyone the chance to sign a card of best wishes to our greatly missed Director of Music, Mr Stout, who is currently recovering at home from illness. The Music Department would like to sincerely thank all those who helped us host such a fantastic opening; the Development and Senior Management teams, Catering Department and musicians. The biggest thanks however, must go to our donors, without whom this project would not have been possible.